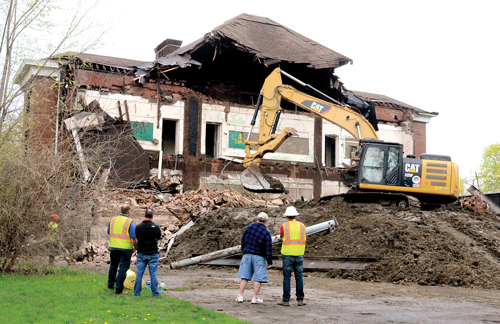 NEWTON FALLS — Newton Falls village officials have expressed interest in using the closed Newton Falls elementary school to house the police department and other village offices. “Right now our police department is crammed into a small area on the first floor of the fire department and municipal court building,” said village manager David Lynch in speaking to the Board of Education at its January meeting. He said fiscally it would not be best for the village to build a new justice building, but instead look for a facility to relocate both the police and other village offices. The district closed the elementary school at the end of the 2017-18 school year as a cost-saving measure and moved students and staff to other district buildings. The elementary school was constructed in 1966 and refurbished in 2007. Superintendent Paul Woodard said talks have just started with the village about the possible use. Lynch said the idea of a recreation center for the community is also being discussed. “We want to work with the schools since they are an essential part of the community. There would be grants available for recreation centers, especially if we work together,” Lynch said. In other business, the board Monday gave an initial reading to placing a 1.75 percent, five-year earned income tax measure on the May primary ballot to generate around $2.1 million annually. Treasurer Julie Sloan said the Ohio Department of Taxation will certify the percentage and mills the district is asking for and the board will take the final necessary action to place the issue on the ballot at a special meeting Feb. 2. In addition to closing the elementary school, the district has cut 28 staffing positions, as well as school programs, to save money. The district also is looking at selling lumber from trees on the property with bids being accepted through Feb. 22. Ken Kline, board president, said something has to be done to generate funds for the district. Officials said if the tax passes, two other current operating levies will be removed. The 6.2-mill emergency operating levy would be removed in 2020, and the other, a 4.8-mill levy that expires in 2021. The two renewal levies bring in $1.3 million to the general fund. Resident Kari Andrukat, a district parent, asked the board Thursday who would be paying for an earned income tax. Andrukat said all residents of the school district who have an income would pay the tax. Woodard said the earned income tax would not affect pensions. Woodard said the district has seen a decrease in student enrollment in the past 10 years, which has led to a decrease in state funding. In the eight years Woodard has been superintendent, 450 students left the district, which means $2.7 million less in state funding. The district receives $6,020 per student from the state. “We have lost a lot of money from the state because of the enrollment drop. Those funds would have been in our general fund and helped us pay our bills,” Woodard said. He said kindergarten classes are at 60 children, while graduating classes are at 90 — down from the more than 100 seniors eight years ago. Officials project enrollment to continue to drop to 40 to 50 students in coming years with graduating classes around 70. Woodard said three years ago the district had to borrow $300,000 to meet payroll. He said other districts facing financial issues, such as Newbury schools, are merging with other districts. Woodard said he would like the district to offer STEM and robotics programs like other districts to retain students. “We can’t get the money from the state that we need. We have trimmed and trimmed. When the auditors are here, they see that we have gotten to the point where we can’t trim anymore. We are almost at a skeletal crew,” he said.